There is always trepidation when you go to watch an amateur production in a theatre you have never been to and I have to say I was pleasantly surprised by this particular venue and the quality of production. The Garrick is a lovely theatre with two spaces, the main theatre and The Lauriston Studio, where Shakers was performed. It’s a tiny auditorium with lots of atmosphere for an audience of under 50 people. Just enough for the intimacy of this wonderful production. The play is a joint collaboration between playwrights John Godber and his wife, Jane Thornton. Jane’s credits include Say It with Flowers, All the Fun of the Fight and the radio play, Spread a Little Happiness. She writes, acts and directs for the John Godber Company now. John Godber is one of the most performed writers in the English language. His other plays include Teechers, Blood Sweat and Tears, Up ‘n’ Under and of course, Bouncers (often considered to be the big brother of Shakers). His plays are energetic, gritty and extremely funny, so I was really thrilled to attend this production and to see what director, Jacqueline Wheble could bring to the stage. In the Garrick bar before the performance, the audience, perhaps a little older than the target audience the playwrights may have been writing for, were served by the cast in-role as cocktail waitresses. The director also mingled among us and light heartedly warned of the spicy language we could expect in the performance. This didn’t seem to stop us all from relishing the content, language and innuendos of the gags. Once inside the auditorium, I found a very polished production and it was hard to critique anything which could be described as ‘amateur’. The stage design was simple but effective; a slick bar, complete with neon surround, some chrome bar stools and tables and the odd cocktail shaker. The lighting and sound both effectively created the cool vibe of this trendy wine bar. Everything was exactly what was needed to give this production the minimalist design the playwright intended. This meant we were left with the opportunity to enjoy watching the performers really getting under the characters’ skin. The four actresses were all seasoned performers with an accolade of roles under their belts and a few Drama degrees, so it really didn’t have the feel of amateur theatre. They were so confident, energetic and incredibly imaginative as they swiftly manoeuvred this script, playing multiple roles from the ageing businessmen to the checkout girls out for a 21st birthday. I was desperate to find a standout performer of the four as they were all incredibly talented and shone throughout the entire play. If I were to pick fault anywhere in Shakers, it would be with the play itself. Whilst we have the fast paced energy of the wine bar, we also have the poignant monologues throughout the play when the waitresses reveal their hopes, their dreams and their past and present lives. Although this gave the play a real sense of depth, it felt somewhat tiresome toward the end, and possibly needed some edits? But these actresses really acted their socks off and the energy they exuded on that stage was a real joy to watch. Their rapport with one another and the audience was entertaining from start to finish. 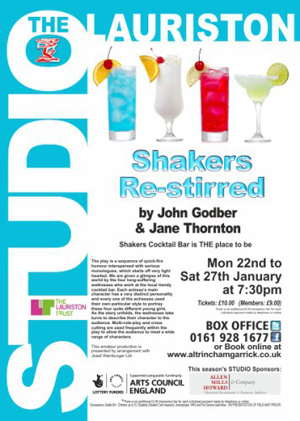 Shakers Re-Stirred runs at The Garrick Theatre, Altrincham until Saturday 27th January and, if you haven’t already done so I urge you to go and get tickets to this great show.